Truthfully, you don't need any tools for most origami models, just the paper, and your hands. That being said, there are numerous models that can benefit from some extra help in the form of tools. Nowadays, they are usually made of plastic or wood. These are used to make your folds crisp. 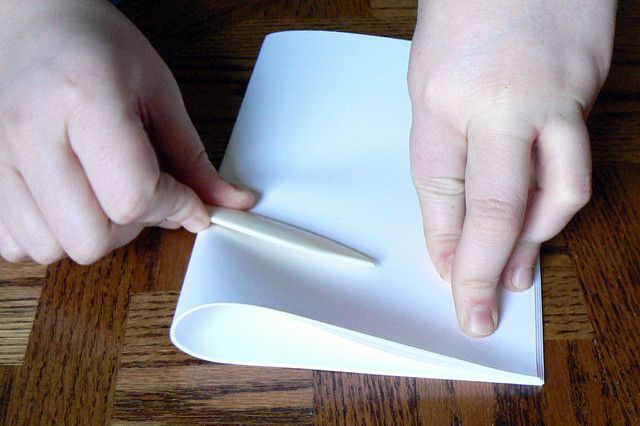 Also, if you are folding a large number of modules or folding many models to sell, these bone folders stop your hands from going numb and getting blisters from all the pressing. A ruler useful if you are cutting your own paper to size or folding a lot of layers, or if you have thick paper or card, you can use them to fold along, to keep the folds precise. Yes, chopsticks! You can use these as bone folders, or even better, to curl the petals of origami flowers, creating rolled up stems and round out ears of animals. There are many traditional origami models that require a few cuts. A nice pair of small sharp scissors will make those that do need them neater. Especially if you are making miniature origami models or making origami roses, a few good pairs of tweezers are a great help. You don't NEED these tools, but they can help with the basics for origami and are especially useful if you also enjoy other paper crafts as well.